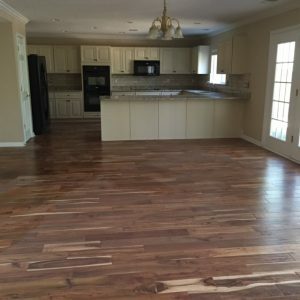 Choosing the right flooring can be difficult as there are many options to choose from. One of those choices is Engineered wood flooring. 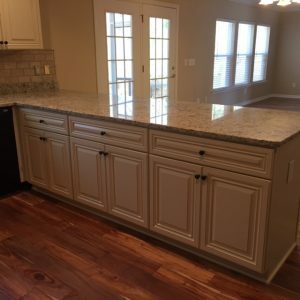 These types of flooring offer rugged durability and phenomenal scratch resistance. Most engineered flooring products are best when glued down. today we will explore some of the pros and cons of engineered wood products. Pros: 1. Engineered products are extremely durable and do not scratch easily. 2. Engineered flooring comes in many different widths, sizes and colors. 3. You can easily get samples of the finished product for matching purposes. 4. Installation is fast and the floors are ready for furniture the moment they are installed. The project in the photographs is about 800 Sq ft and the install took 2 days. 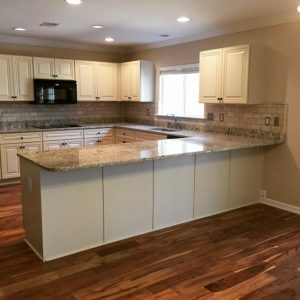 We also did custom cabinets, tops and back splash. 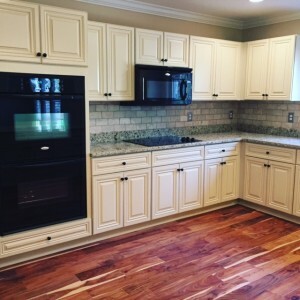 This home is currently for sale in Lexington SC 29072 off Corley Mill Rd. These engineered products can be a good alternative to oak flooring and carry some long term durability traits that you cannot get in oak. There still isn’t a true replacement for the real thing on the market but these floors are are going to be beautiful for a long time to come.